With 25 years’ experience in running The Global Leadership Summit, the marketing team was working with what they “thought” they knew about attendees. When they began testing, however, they realized that their customers could still surprise them. By introducing testing and value proposition into event email marketing, the team was able to increase email-driven event registration by 66%. Read on to see how they did it. 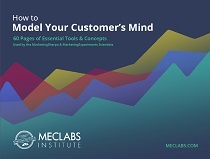 You can also tune into a MECLABS webinar Oct. 4 to hear the full story, sign up here. 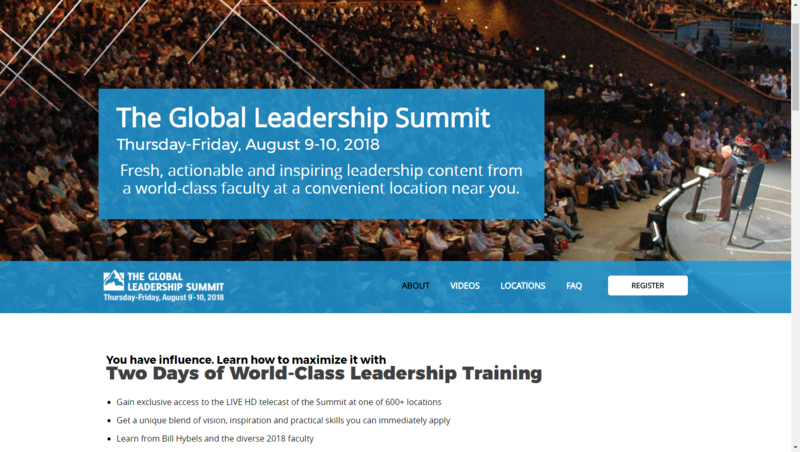 Coming up on its 25th year, The Global Leadership Summit, hosted by Willow Creek Association, is a two-day leadership training event. “This year, we'll have about 400,000 people attend from 128 countries in 60 different languages,” said John Jordan, Executive Director of Digital Marketing for The Global Leadership Summit. Each year, a dozen or so world-class speakers participate. For example, this past year Sheryl Sandberg from Facebook spoke; Melinda Gates is also a past speaker. “We bring together a mix of leadership experts who provide practical leadership skills that, ideally, people can walk into the office on Monday and apply,” he said. The event happens just outside of Chicago and is live telecast to more than 600 sites around the United States and later, around the world. While the Willow Creek Association is an international Christian ministry, The Global Leadership Summit event attendees come from the business world, churches, schools and nonprofit organizations. “Our mission is to provide better leadership to people who not only have leader in their title but anybody who has influence, whether it's a midlevel manager, a stay-at-home parent, a soccer coach — whoever would benefit from becoming a better leader,” he said. He said that previously, marketing decisions had been made based on their preferences, intuition, industry best practices or their past experiences. The team had never applied testing to what they were doing with any sort of method. This year, those levers were (1) optimizing event landing pages and (2) optimizing emails. “[They were] two of the biggest areas within our marketing that we could affect to improve our registration numbers,” he said. Once the team identified landing pages (and registration funnel optimization) as well as email as the two biggest levers that could be pulled to increase event registration, they got to work optimizing. “We were going to do that optimization work but also some new initiatives. We had to identify those opportunities,” Jordan said. To find those opportunities, the team looked at the event marketing calendar for key pricing deadlines to create moments of urgency. “The biggest shift this year was creating more moments of urgency within our event marketing calendar,” he said. However, in March there was no pricing urgency coming up until June. So, the team decided to leverage content with the founder of the Summit, Bill Hybels, to create this sense of urgency. “We created urgency with an email to get this ‘Best of Bill Hybels’ DVD,” he said. Not only was that email introducing urgency, since there was a deadline to register by in order to receive the DVD, but it was also adding value. “As a result, we had 1,080 additional registrations from creating that moment, and the primary channel on that campaign was email. We did echo the offer messaging on social media, but 95% of the registrations came in via email,” Jordan said. As the team moved into May, June and July leveraging urgency, they enlisted a countdown timer in emails so people could visualize the clock ticking down the time left on the offer. Then, as the prospect clicked through to learn more, the landing page would echo the urgency with a continued countdown timer. A team value, he said, is to be “incessantly tinkering.” For example, when the team saw the added urgency work, they ended up adding another moment of urgency to the two already scheduled. “We did another email incentive campaign, and we did this ‘Best Talks of the Summit’ DVD incentive. People received 25 different talks from past years’ Summits. So, rather than doing additional pricing incentives, we were adding value and communicating that via email,” he said. Typically, they reach out to people who have attended past events, and email is “probably our strongest retention play,” Jordan added. So much so, he said, that they began requiring an email address for every ticket purchase. Despite concerns that they would alienate customers, the team ended up getting 92% unique email addresses for every single person who had registered for the event. “Our email capture rate went way up the last few years. That has made a huge impact on the size and quality of our database,” Jordan said. The team also found success in getting new email acquisition by giving away free downloads in exchange for an email address. Then, they would continue nurturing those prospects with 20-25 different emails, preparing to ask them to attend The Global Leadership Summit. Jordan’s favorite aspect of the testing they’ve done in the past year is the cultural transformation. Internally, he said, he has seen tremendous growth in the number of people who are involved with weekly testing meetings, some of them even getting put through a graduate certificate program focused on testing and optimization. “It is truly transforming the way we talk about things here. It has been incredible because now our answer to new ideas is not, ‘Oh no, I read this and you read that.’ It's, ‘How can we find a way to test that?’ And three years ago, that would have never happened, he said. The team also went through a workshop on value proposition communication, where they learned how to focus on clearly communicating the event’s value prop throughout all marketing channels. “We were able to use what we learned from the value prop workshop in our Summit landing page, which became the guide for our marketing language throughout the rest of the year,” Jordan said. This helped with the cultural transformation by inviting people from different teams and levels into that process. “We had a room of 30 people from our development team, our Summit marketing team, our content team and from our executive staff. It was amazing that it was a cross-functional group, but it was also people who are in different parts of a thinking wavelength,” he said. Leaders at the organization who focus on high-level vision attended, and “minders and grinders who are in the day-to-day operations with customers … [were] all buying in to defining our value prop for the summit,” Jordan said. Having all those people and groups understanding the event’s value proposition had a quick effect, to the point where the language used to speak about the Summit had changed. “Hearing that [new vocabulary] filter out beyond that room from where we did the value prop [workshop] was amazing,” he said. That understanding of value proposition connected a lot of dots, and Jordan’s team brought it into everything from marketing materials to email subject line testing. “We positioned content in our emails, all of our PPC testing [where] the first line is value and the second line is a micro-yes. That got applied everywhere, but it gave us a starting point for our testing. Then we could validate what we learned in the value prop workshop,” he said. With the discoveries from the value proposition workshop and PPC, the team began focusing on testing content in the event email marketing. One test focused on the order of the speakers listed in an email. “We were trying to segment our list based on interest early on. So, we would have speakers who are Ph.D. thought-leaders or we would have high profile speakers from businesses like a Sheryl Sandberg or Marcus Lemonis,” he said. The email had the speakers clustered in rows of three, and the team varied those clusters to eventually have eight different combinations of the same email to see which would be most popular. “Then, whether they registered for the event or not, we could see how they responded based on the different types of content placement and send them either information from our GLSnext app or ‘Follow the GLS blog’ based on the type of content they self-selected,” he said. The team also tested highlighting some of the more well-known speakers in the subject line, as opposed to something more generic. 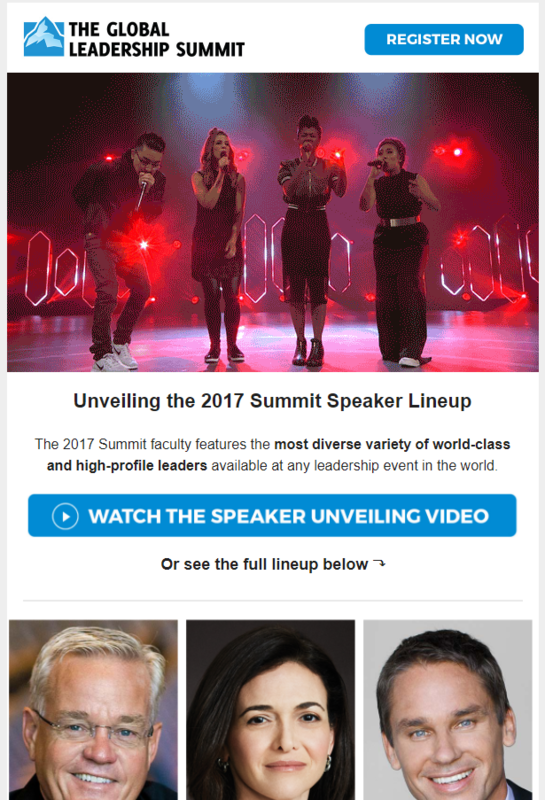 Rather than having a subject line that says, “Come See Sheryl Sandberg,” he explained, the subject line that reads, “Come See 13 World-Class Speakers” ended up being of more value. The more geographically localized treatment resulted in an additional 87 registrations than the general control messaging. There was a similar test on the event landing page, but it found a different conclusion through testing. The team thought that by localizing landing page content, they would be more relevant and specific to potential attendees, and hence see more registrations. “We have more than 600 different host sites. Rather than emphasizing on the landing page the experience here in Chicago where the event is broadcast from, we were emphasizing the local experience from many of these different host sites and asking the user to self-select their location first,” he said. “What is so beautiful is, as more people in the organization understand and buy into testing, hearing people challenge that and say, ‘What if?’ It's amazing,” he said. There are more than 600 organizations across the United States who host the Summit, Jordan said, and “if we can empower the local marketers at the 600+ locations and give them confidence to test either for their own organization or as they promote the Summit locally, we will see exponential growth for the event, he said. “Just as we have been trained, we think we're going to get the biggest impact by starting to train others on the importance of testing,” he said.